Welcome to the Commencement Issue of Findings, the online newsletter for PRGS alumni. Albrecht wins inaugural PRGS alumni award ~ Wardynski, McGlynn earn top honors ~ more . . . The role of PRGS is to complement the heart and passion and intelligence you bring to the school, to provide you with a set of tools and experience that reaches beyond academics to the real world with its very real problems. What we teach is not the end point. It is a resource you draw upon as you develop an understanding, start the unraveling, and begin taking on the insecurity, instability, and inequity of the world we live in. Look around you, live in this world, and find those things that matter to you, to your community, and to the people who are doing the work, living their lives, and feeling the effects of governance and policy. And then use the analytic tools you have and the evidence you gather to identify what matters. When this knowledge is combined with your heart, you will be the answer to the challenges in our communities and the world. 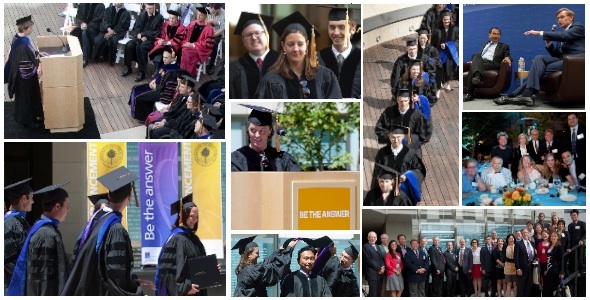 Clockwise from top left: Dean Marquis addresses the graduates; Brian Weatherford, Brooke Stearns Lawson, and Jeff Tanner; graduates file in; honorary degree recipients Francis Fukuyama and Robert Zoellick; Mark Albrecht and his family; PRGS alumni; Fukuyama receives honorary degree; graduates prepare to Be the Answer; Elizabeth Brown addresses her classmates. Helen Wu (cohort '07) coauthored " What's on the Menu? A Review of the Energy and Nutritional Content of US Chain Restaurant Menus " with professor Roland Sturm, in Public Health Nutrition. She was interviewed by and had her research cited in more than a dozen news outlets. Daniel Waxman (cohort '10) coauthored "Utilization of Anesthesia Services During Outpatient Endoscopies and Colonoscopies and Associated Spending in 2003-2009" in the Journal of the American Medical Association. Lisa Klautzer and Todi Mengistu (both cohort '07) and professor Soeren Mattke coauthored a RAND paper, Medicines as a Service A New Commercial Model for Big Pharma in the Postblockbuster World. Marco Angrisani, a RAND associate economist who taught Advanced Econometrics II this year, is the recipient of the Edwin E. and Mary T. Huddleson Outstanding Teacher Award; Christina Huang (cohort '10) received the Teaching Assistant award. One of Marco's students, Nono Ayivi Guedehoussou (cohort ’09), in recommending him for the award, noted, "Marco was always prepared for his classes. Students could definitely see that he spent hours making his lectures clear and concise. He was also available for questions during his office hours. He was very amenable to writing on the board and deriving proofs so that we could better understand his materials. Also, all datasets used as examples were provided so we could replicate the analysis that was done. I got so much out of AEII that I am sure I will refer back to my class notes given their clarity and completeness. Great teacher!" Mark Albrecht (cohort '73) received the inaugural Alumni Leadership Award during Commencement Weekend. The award was designed to recognize prominent alumni who show passion, leadership, and discipline in their careers, and who make important contributions to public service. Mark has been a leading figure in the American space program for more than 20 years, as executive secretary of the National Space Council, president of Lockheed Martin's International Launch Services company, and chairman of the board of USSpace, LLC. PRGS Alumna and Board Member Samantha Ravich (cohort '92) presented the award to Mark at the Friday night dinner. Casey Wardynski (cohort '97) retired from the U.S. Army in 2010 and is now serving as superintendent of Huntsville City Schools, Huntsville, AL. He hit the ground running and was selected as Alabama Outstanding Superintendent of the Year in 2012! AcademyHealth's Distinguished Investigator Award recognizes investigators who have made significant and lasting contributions to the field of health services research through scholarship and teaching, advancement of science and methods, and leadership. Beth McGlynn (cohort '83), Director of the Kaiser Permanente Center for Effectiveness & Safety Research, is the most recent recipient of this prestigious award. After 14 years as senior researcher at RAND Health, Donna Farley (cohort '89) retired in September 2010. Although she still serves as an adjunct RAND staff member, Donna has made time for herself to smell the proverbial (and literal) roses. She recently spoke with Jeffrey Wasserman (cohort '85), Assistant Dean for Academic Affairs at PRGS, and reflected upon her experiences both as a PRGS student and a RAND researcher. More than 100 people joined us April 13 at the 6th Annual PRGS-UCLA-USC-Pepperdine Los Angeles Policy Symposium at RAND's Santa Monica headquarters. The keynote speaker was Dr. Jonathan Fielding (Director, LA County Department of Public Health), and the event also included student presentations and panel discussions on Health, International Development, and Domestic Economic Development. UCLA professor and renowned futurist Jared Diamond was the guest speaker at the PRGS International Development Speaker Series on April 23; his topic was "The Fundamental Problems Facing Japan Today." Other speakers this semester included Dean Karlan, president and founder of Innovations for Poverty Action (IPA); Anne Krueger, professor of International Economics at the Johns Hopkins School of Advanced International Studies; and Deborah Derrick from the Bill and Melinda Gates Foundation. (from l to r): Rick Fallon, Michael Beltramo, Florencia Jaureguiberry, Hui Wang, Mark Albrecht, Loren Yager, Edmund Conrow, Jeffrey Wasserman, Yilmaz Argüden, Samantha Ravich, John Fei, Bryce Mason, Diana Epstein, Yang Lu, Brian Weatherford, Bruce Wetzel, Ben Mundell, Sarah Gaillot, Richard Bowman, Claudia Diaz, Kateryna Fonkych, Lindsay Daugherty, Sara Hajiamiri, and Chung Pham. 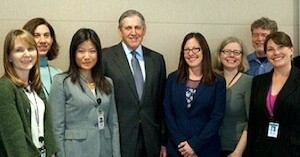 RAND's Washington office hosted a gathering of PRGS and RAND alumni on May 1. View a photo album of selected photos, on PRGS's Facebook page. 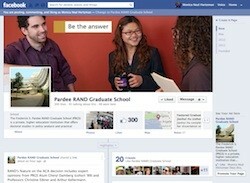 We're revamping the Alumni section of our website to make it more useful for you. We now have a page focusing on Alumni news, an archive of Findings newsletters, a form to enable you to keep in touch, and of course Commencement news and archives. Have a suggestion for the site? Let us know!